ORLANDO, Fla. (AP) -- The number of strip-mall parlors with slot-like computer games such as those targeted in a racketeering investigation could shrink if the Florida governor, as expected, signs a bill banning the operations that have contributed more than $100,000 to local political campaigns. Some estimates put the number of gaming parlors in Florida at almost 1,000, and investigators targeted almost 50 affiliated with Allied Veterans of the World. The purported charity was a front for a $300 million gambling operation and gave just a small portion toward veterans, state investigators have said. The defendants say the parlors are merely places where people can legally play sweepstakes games while using the Internet. But Florida legislators last week voted to ban them and Gov. Rick Scott was expected to sign the bill Wednesday and his office said the law will take effect right away. What is unclear is whether gaming parlor interests will challenge it in court. Tallahassee attorney David Ramba, who is an agent for many of the political committees that represent the industry, said he has told his clients to shut down their operations Tuesday night. Nearly 90 local officials and candidates in 20 Florida counties received political contributions from the parlors — sometimes called "Internet cafes" — their owners and their political committees over the past few years, according to an Associated Press review of county-by-county campaign records. It included a sheriff whose agency was a part of the probe. On the state level, more than $1 million was contributed to officials and candidates by companies with ties to Allied Veterans. Some top politicians in Florida and North Carolina scrambled to give back the money or at least explain it. Former Lt. Gov. Jennifer Carroll resigned last month after she was interviewed as part of the probe. She denies wrongdoing. In local races that usually cost much less to run, the gambling affiliates and their owners donated to sheriffs, judges, mayoral candidates, county commissioners, prosecutors, clerks of courts, property appraisers and tax collectors. The bulk of the contributions were in Duval County, home to Jacksonville, where officials received about $50,000 from the local parlors and their owners. The Jacksonville City Council in 2010 considered shutting down the centers. But city council members instead overwhelmingly passed compromise legislation that capped the number of existing cafes and required them to pay fees and be better regulated. Allied Veterans and the owners of its affiliates fought hard against the crackdown in Jacksonville, hiring lobbyists and donating to candidates. Among the largest recipients in Duval County was city councilman Richard Clark who received $3,750 from the Allied Veteran affiliates and another $1,000 from Floridians for Internet Access, a Tallahassee-based political committee with ties to Ramba. Clark said the donations made very little difference in the outcome of the vote on the Jacksonville ordinance, given their small amounts. During the debate on regulating the Internet cafes, "most of the heart-strings were pulled by the mom-and-pop small businesses," Clark said. Investigators last month said Allied Veterans spent just 2 percent of its $300 million earnings on veterans' charities while its leaders spent millions on boats, real estate and sports cars. The 57 defendants, including some police officers, are facing racketeering, conspiracy, money laundering and possession of slot machine charges. Donations from the cafes were made in Brevard, Broward, Clay Collier, Dixie, Duval, Flagler, Hernando, Hillsborough, Lake, Leon, Manatee, Miami-Dade, Monroe, Nassau, Palm Beach, Pinellas, Sarasota, Seminole and Volusia counties, according to the AP review. Donations to Florida candidates are limited to $500 per person per election. Out-of-state gaming interests from Georgia , Nevada, North Carolina, Oklahoma and South Carolina contributed almost $25,000 to the local races. Jacksonville Sheriff John Rutherford received $9,000. At the time, Rutherford's agency was investigating Allied Veterans, along with other law enforcement. Rutherford said he knew some of his 2010 campaign donors were under investigation, but he decided to accept the money so the probe wouldn't be exposed. "We took the donations, business as usual, since we certainly didn't want to tip off two high-profile police officers that they were under investigation," Rutherford said. After the arrests were announced last month, Rutherford said he made $10,000 in donations to two veterans' organizations. Jacksonville city councilman Clark said he knew some of the Allied Veterans business owners initially from their offer three years ago to pay for a city Veterans Day parade that was threatened by budget cuts. The city ended up coming up with the money for the parade. But he said he didn't know all of the affiliated donors. "At $500 a pop, the amount of checks it takes to raise $100,000, you just can't know everybody," Clark said. Mario Rubio, a city council candidate and brother of U.S. Sen. Marco Rubio, received $850. 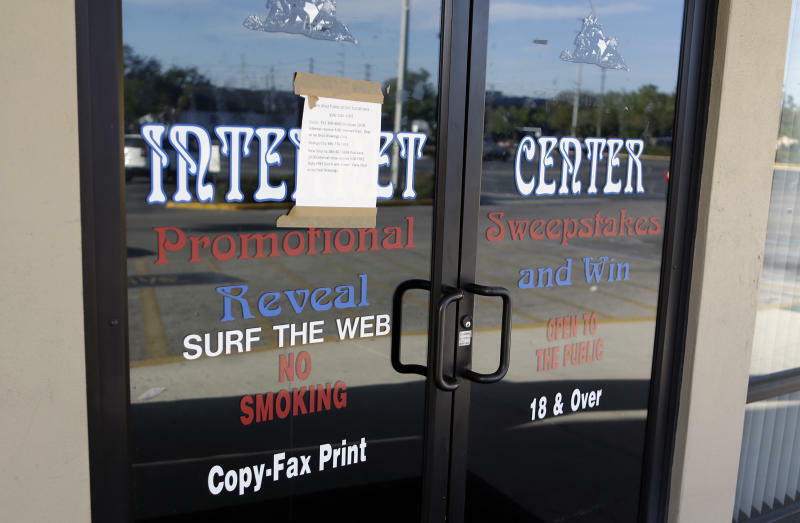 Candidates in Palm Beach County, where commissioners in early 2012 approved a yearlong moratorium on the opening of new Internet cafes in unincorporated areas, received almost $15,000. Most went to the local state attorney, Dave Aronberg. County commissioners allowed the ban to expire late last year. A spokesman said Aronberg never took a position on the moratorium and said he knew of no Internet cafe cases that have come through his office since he was sworn in earlier this year. Spokesman Mike Edmondson said Aronberg believes he was supported by the Internet cafe interests because "he was more receptive to having a general conversation about Internet cafes at that particular point." "He wasn't passionate for or against," Edmondson said. Groups affiliated with Ramba, the Tallahassee attorney, contributed more than $15,000 to judicial, commission and property appraiser races in Brevard, Leon, Miami-Dade and Palm Beach counties. Two groups, Floridians for Internet Access and Save Our Internet Access, were political committees. In an email, Ramba said some of the contributions were made to candidates with whom he or his clients had a long-standing relationship. He said the committees were formed to participate in the political process, just like other businesses. "Just because the State Capitol is here doesn't mean the clients are located here," Ramba said. "Many clients have individual local relationships." Many of the companies that made donations to local candidates had ties to Jacksonville attorney Kelly Mathis, who investigators claim was the driving force in the Allied Veterans scheme. Mathis and his law firm gave more than $5,300 to local races. In an interview, Mathis said he didn't direct the affiliates on how to make their donations. "That was their decision," Mathis said. "I gave them legal advice." Some candidates who received the donations from the gambling affiliates didn't keep them, skeptical of why they received the money. Associated Press correspondent Tamara Lush in St. Petersburg, Fla., contributed to this report. Follow Mike Schneider on Twitter at www.twitter.com/MikeSchneiderAP .